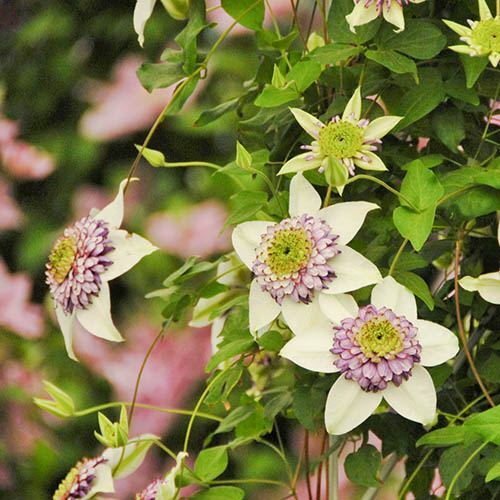 A stunning variety with some of the most remarkably ornate flowers of any clematis. Very free flowering, the blooms appear all summer from June to October. Grow in a conservatory and it may even be flowering at Christmas! The perfect Clematis for a large pot and obelisk, growing up to 6ft. A stunning variety with some of the most remarkably ornate flowers of any clematis, 'Viennetta' produces unique, eye-catching blooms with centres filled with hundreds of smaller purple petals, framed by beautiful creamy-white petals. Creating a rather striking two-tone effect, the flowers can grow to 10cm in diameter! Very free-flowering, the decorative flowers appear all summer-long from June right through to October. In fact, if grown in a conservatory it may even be flowering at Christmas! The perfect Clematis for a large pot and obelisk, 'Viennetta' witll grow up to around 6ft - ideal for smothering fences and other unsightly walls and outdoor buildings in flower for almost half the year. In the border, grow through other shrubs where its roots can remain sheltered from the elements slightly. 'Viennetta' may look spectacular but it's easy to grow and pruning is simple - just cut everything back in winter to a height of 6in. Flowers will then appear on new growth. Delivered as a one year old plant in 7cm pot to plant on receipt.